Such grim, devastating news tonight, regarding actor Robin Williams (1951 – 2014). I can’t quite believe any of it is true. I still remember the first time I saw him on TV. The year was 1978, I believe. 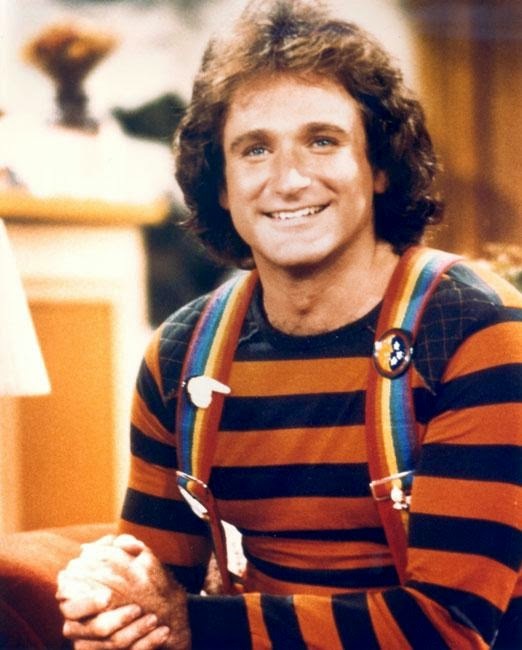 It wasn’t long after that appearance that Mr. Williams played Mork on a regular basis on Mork and Mindy (1979 – 1982). I loved him as that zany, irrepressible, child-like character, and the truth is that I will always associate him with that particular role, which in some way was incredibly innocent. Of course, Robin Williams had an extraordinary and prestigious career far beyond his turns as Mork as well. He played Popeye in Robert Altman’s 1981 film, and earned kudos for work in films such as The World According to Garp (1982), Good Morning Vietnam (1987), Dead Poet’s Society (1989), and Good Will Hunting (1997). In terms of genre roles, Mr. Williams was remarkably versatile. He played terrifying villains in films such as One Hour Photo (2002) and Insomnia (2002), and was also terrific as the lead in What Dreams May Come (1998). This loss is such a terrible one, because -- from Mork to Popeye to Batty Koda (FernGully) to Fender (Robots) -- Robin Williams made us smile, and he made us laugh so damned much. My deepest condolences to his family in this time of terrible grief…but also to all of us, who will miss him. The world is a lot less happy tonight, without the light Robin Williams brought to it.